The challenge at MFP Speedy & Friends challenge #130 is "leaves." 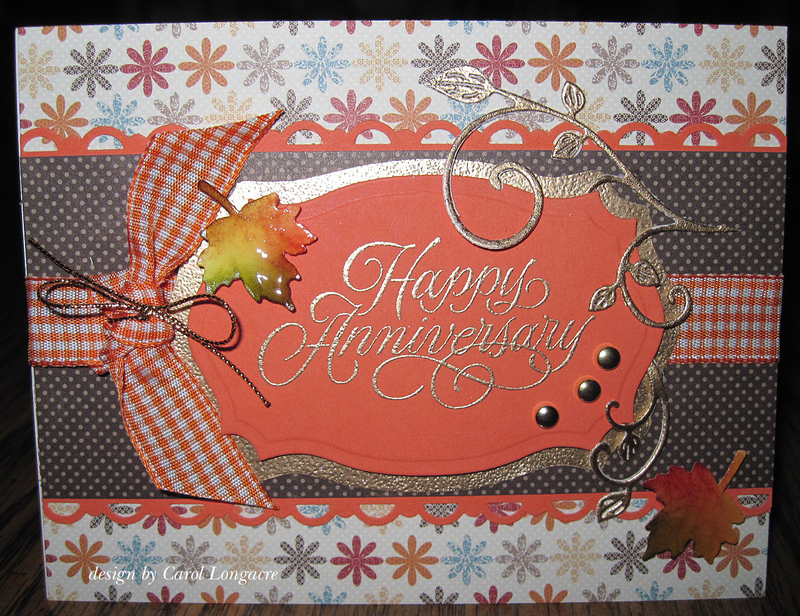 I made this card for a sweet friend who celebrates an Autumn anniversary, so I used Autumn Spice dsp's from LillyBee and added a few punched leaves done with a MS punch. I colored the leaves with Copics and added glossy accents to make them look realistic. I used a labels 25 die for the main panel and mat, embossing the edges, sentiment and flourishes with gold ep. I added 3 brads, some pretty gingham ribbon, and a little piece of gold cording for the finishing touch. It's a gorgeous Autumn day here in PA, and I hope wherever you are it's just as nice! Have a great day! Love that touch of gold! Great layout. Thanks for joining us at Speedy Fox & Friends. Wow, this is really pretty. I especially like the embossing and the gingham ribbon. Thanks, for joining us over at Speedy Fox and Friends. Autumn.....we still don't know what that is down here - back up in the 90's again today! Sigh!!! LOVE this and the glossy accents on the leaves are so pretty! Beautiful card! Love the glossy leaves. Thanks for the glossy accents hint. I will have to try it. Thanks for joining Speedy Fox and Friends. Carol, there are so many nice "extras" on this card! Beautifully designed! What a beautiful card!!! I love those beautiful leaves and how glossy they are! Great card! Thanks for playing along with us this week at Speedy Fox & Friends blog challenge! 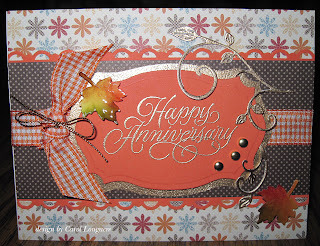 Lovely job of using leaves...great punch and coloring...your card is beautiful. Thanks for playing along with us this week at Speedy Fox & Friends. The glossy accents look great on the leaves and love all the gold embossing. It's a wonderful Fall card. This is so gorgeous! I love the colors and the layout. Heck I just love the whole thing. I may have to CASE it. Thank you for playing along with us at Speedy Fox and Friends!